Hasbro’s Comic-Con breakfast has arrived, and with it, a plethora of new toys to gawp at. 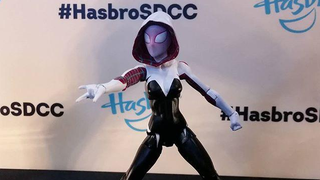 The company has unveiled some brand new figures in both its Marvel and Transformers lines, while they’re all pretty smashing, the best news of all is that the fabulous Spider-Gwen is getting her own toy! And if you collect all six, you’ll get the parts to build a special Absorbing Man Build-A-Figure. But seriously, you’re here to see the lovely pictures—including the Spectacular Spider-Gwen! Good lord, can these come out now? My wallet is aching already. We’ll have more on all the lovely new toys coming out of Comic-Con as the show progresses. SDCC is in full swing! You can keep track of all of our Comic-Con Coverage here.